It's been awhile since we blogged about this now "plugged Chesapeake well." Over 3 Months later and there's still no housing construction activity on this now former drilling site that had been the source for so much controversy over the years. As you may recall, this private land (about 19 17 acres) was suddenly being promoted by a "Housing Developer" who hadn't really completed any MAJOR housing developments anywhere. He had a "Yahoo" account for his business e-mail address. Yee Haw!! He was asking for a "Zoning Change" from "Retail/Commercial Development" to "Residential Development." 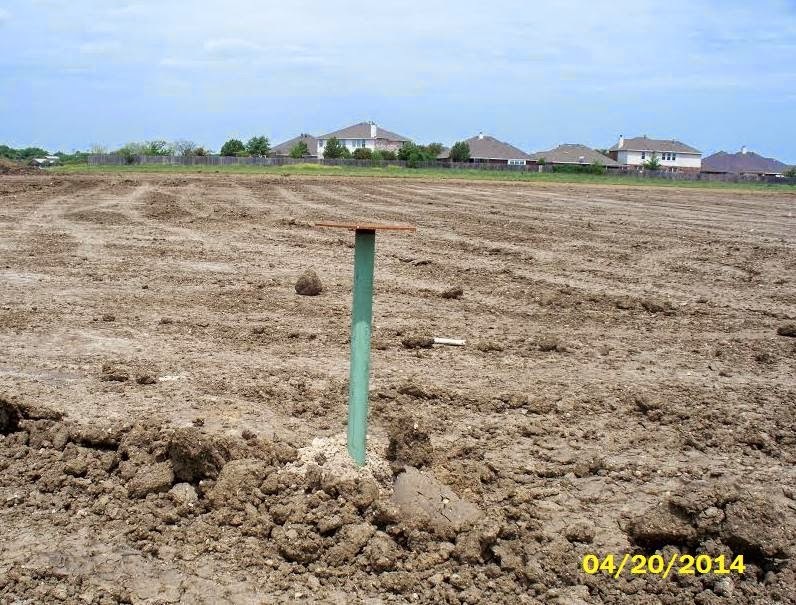 After some debate, this "Zoning Change" was eventually approved by Grand Prairie's City Council on May 20, 2014. Yes. It's true. A gas drilling site was "Zoned" Retail Commercial at some point in the past. It was never zoned "Industrial." So much for "Zoning." For the recent background for this story, click here, here, and here. In the meantime, we discovered that the Grand Prairie, TX Interactive Aerial Google Map for the drilling site's address (210 W. Camp Wisdom Road) does show the site and the FRAC tanks in place for a FRAC Job. (Plug in the Address and Check "Gas Wells" under General Info at the link. Then at the top scroll over to "Aerial View.") Wow. For a 3-day operation, this FRAC Job seems to have become a permanent fixture for this land and its history. Good. Click on the map to see the bigger picture (with added text and labels). The Alliance had pointed out (in late 2011 and early 2012) that there was a "Moratorium" on ALL gas drilling activities within 3,000 FT of ALL water retention structures inside City Limits. We ALSO pointed out (during City Council Hearings) that adding a pipeline would be in "violation" of the city's own "Moratorium." We were surprised by the city's attempts to get this pipeline hooked up...very surprised. Shocked, really. Good Grief! The city also told us that there was all sorts of oversight while this well was finally being plugged just this past April 4, 2014. Paperwork (the Form W-3) was said to be completed/signed by the Railroad Commission while their inspector(s) was/were present and even Grand Prairie's Gas Well Inspector was said to be present for the operation conducted by Chesapeake. "Fool me once, shame on you ~ fool me twice, shame on me." We think there's been more than enough foolin' and downright goofin' with all of this. Amen.